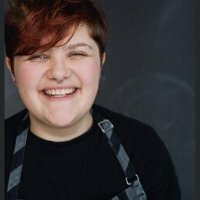 Chef Becca started volunteering with us in January 2017 as a project apprentice – these are the office angels who help us with all the backstage work that allows us to deliver our cooking programme to thousands of people every year. She then went on to work for us as a paid teaching assistant. But apparently it isn’t just us that gained from having her around, she says she’s also got loads out of the experience. Our founder Sarah talks to Becca about her experience with us. Sarah: What have you been up to with us over the last year? Becca: First I spent three months as a project apprentice. I made a 'Wall Of Fame' for the kitchen walls of all the amazing kitchen hire clients who use the MIH kitchen. I picked up the veg from Growing Communities and reorganised the dry store which, sadly, is my idea of heaven! During that time I had the opportunity to attend the Professional Bread Makers course which was fantastic and get paid work as a teaching assistant on a Family Cooking For Life class. Sarah: We’ve kept you busy then! Becca: Totally. I got my Food Hygiene Level 2 certificate. I learnt how to use websites such as Billetto, Mailchimp and Survey Monkey which I was clueless about before. I developed my communication skills both on phone, emails and in front of a class. I learnt more about social media and social media strategies. I learnt a lot about various grassroots food organisations and was introduced to loads of amazing community activists and talented chefs. I learnt growing skills in a community garden and I took part in a Professional Breadmakers intensive training which led to me taking on dough shifts at one of the top sourdough bakeries in London – Brickhouse Bread. Sarah: Any surprises during your experience? Becca: Not about the role as I was briefed really well about it – but I was genuinely shocked about how lovely everyone was. Most of my working life has been spent in fast-paced macho kitchens where the focus is on manically getting things done. At Made in Hackney I was met with grounded and proactive people who were juggling loads of balls at once whilst also being able to have great conversations, a laugh, connect with each other and care about each other and about big issues in the wider world. Becca: So many laughs. One particular class participant always rang to confirm he’d be attending the class. What could have been a 2 minute conversation was always a fifteen minute rollercoaster of a conversation – it was brilliant. He’d say funny things like, "No one bleeding told me it's all women on the course. I'm literally the only bloke there! Last week it was just me and 15 women. I literally thought I was gonna get nagged to death!" He’d follow this kind of comical feedback with ten minutes of praise for how good the course was. It was a great part of my day. Sarah: Has volunteering with us influenced your next steps in life? Becca: Yes! As a result of participating in the Professional Breadmakers Intensive, I have gone on to work in the bakery at Brickhouse Bread. I'd been wanting to train in sourdough for many years but never had the cash to take one of the courses run by artisan bakeries. This training is opening up a whole new area in my career and could lead to me teaching bread making or running a micro-bakery in the future. During my time working with Made in Hackney I have also realised that working with food in a community context really feeds me and has helped me develop in loads of areas of my life. I am now looking to work much more in community food, either through more teaching or even taking on a full time role in a food charity. Sarah: Has the experienced improved your health and wellbeing? Becca: Absolutely. I had felt for a while that working in a commercial kitchen was quite isolating socially, it's hard to see friends and family. Often you’re just churning out meals made from ingredients you haven't grown, from farmers you haven't met, for diners you'll never talk to. In that way the whole cycle of growing, cooking and eating food is cut off and isolated. Since working with Made in Hackney I’ve felt much more energetic, social, confident in public speaking and I’ve met with some really heart-warming organisations, projects and people. My life feels more grounded and harmonious.